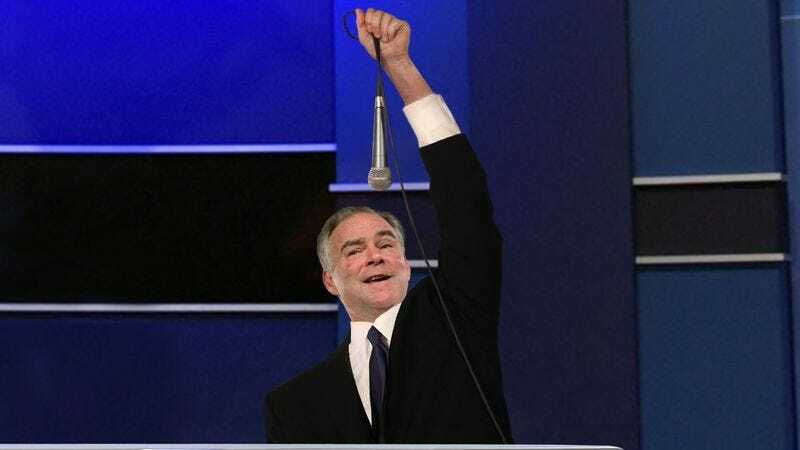 FARMVILLE, VA—Admonishing the Virginia senator for repeatedly interrupting his opponent’s responses, CBS News moderator Elaine Quijano sternly issued a final warning to Democratic vice presidential candidate Tim Kaine roughly 30 minutes into Tuesday’s debate to stop playing around with his microphone. “For the last time, Senator Kaine, when Governor Pence is speaking, please refrain from making any sounds like a dog, race car, or monkey into the microphone,” said Quijano, appearing visibly exasperated after the Democrat, who had previously been reprimanded for swinging the microphone around by the cord and calling it his “grappling hook,” declared loudly in a monotone voice, “I am a robot named Tim, beep bop beep,” and then proceeded to lick the microphone like an ice cream cone. “The microphone is for delivering remarks—okay, get that out of your mouth right now. Now, Senator Kaine.” At press time, sources confirmed the vice presidential nominee was crouching behind the lectern with his eyes tightly closed to hide from the moderator.